To preview UIs on embedded devices, you need to connect the devices to your system and configure connections to them. The necessary kits have been predefined and you only need to enable them for your current project. Deploy configurations handle the packaging and copying of the necessary files to a location in a device where you want to run the executable at. In Projects > Build & Run, enable the kit predefined for the device type (1). Select the kit for the device in the kit selector (2). Select Build > QML Preview or press Alt+P. 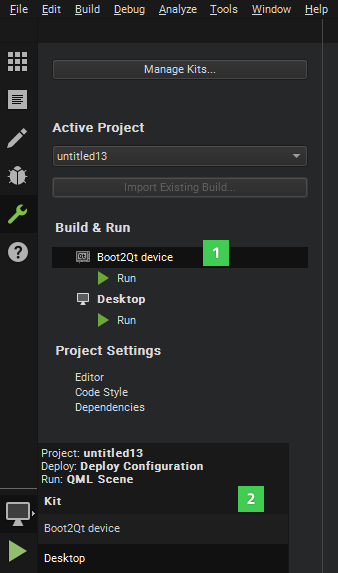 You can preview UIs on embedded devices that are supported by Qt for Device Creation. For a list of supported devices, see Reference Target Devices. You must configure the device as instructed in the Installation Guides.